I like the things of the night. 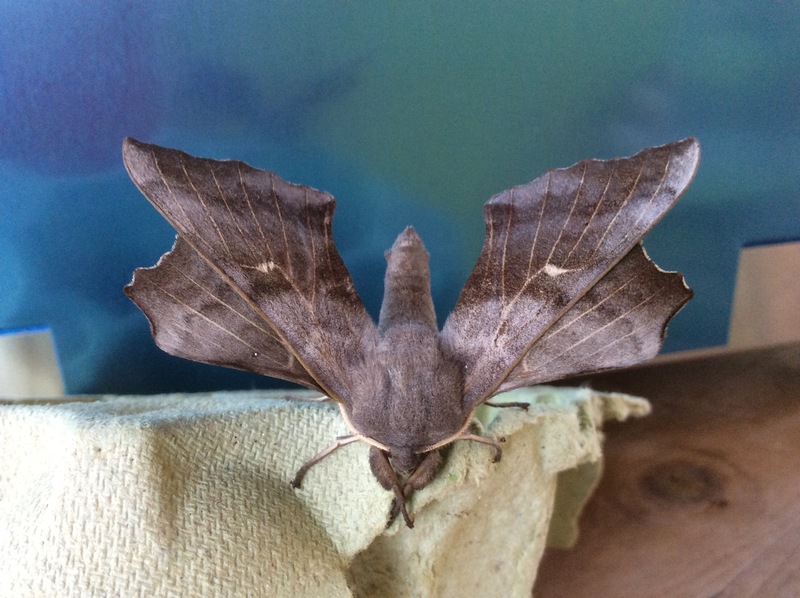 For me moths and bats have a mystery and a glamour unsurpassed by butterflies and birds. As their world takes place where I can not see, my fascination grows. To humour me, my husband bought me a moth trap and a bat detector box for my last birthday. I have shared a few finds from the moth trap in previous posts and this weekend I was intrigued by this broken twig of a creature called a buff tip. The mimicry is perfect from the blunt face of the twig end to the exposed heart wood of the white wing. During the day they rest safe from the gaze of hungry birds in trees, but at night when they fly out they are prey to the hunters of the night . I have always wanted a bat detector, since I saw them being used by experts from my local wildlife trust. The high pitched echo locationtion used by bats is inaudible to human ears, but each species of bat echo locates at a different frequency and by noting which frequency the bat calls at, you can work out which type of bat is swooping over head. I am just learning to use my bat detector and if there are any experts out there I would love some advice! So far I think I have identified noctuel bats, but were they ordinary noctuels or lesser noctuels? Their call is loud ” chip chop” over the earphones. I have also heard pipistrelles, but again, where they standard ones or Pygmy pipistrelles? At the very top of the range I caught a tantalising burst of the burbling sound of horseshoe bats, but which type? I have a lot to learn and a lot of sleep to loose in the back garden peering into the darkness, but it beats worrying about the darkness of the human soul and reminds me of how little I know and how many mysteries there are still to explore! For those of you interested in bats this wonderful you tube clip by Daniel Hargreaves shows lesser horseshoe bats calling from a roost and I swear two of them are dancing! I am originally from Liverpool, not Manchester, but the minutiae of geography is profoundly insignificant in the presence of a powerful poet, trying to put people back together after another a horrible tragedy. We may know that the shape of a flower has evolved to attract pollinators, but to human eyes, their variety is an irresistible opportunity to day dream and to nick name. My favorite flower at this time of year is Columbine ( Aquilegia in Latin). My garden is overflowing with them at the moment, all from local wild seed, they are a riot of pale pinks, mauves and deep dark purples. The long tongued garden bumble bee is certainly attracted to their shape and in extracting nectar, faithfully pollenates each flower. Other species are lazier and if you watch carefully these nectar robbers just snip into the spur and steal the nectar without touching the pollen. I knew that Aquila is Latin for eagle and some see the claws of the eagle in the curled spurs at the back of the flower, but I never understood the English name columbine. In a herbal I read recently that Columba is Latin for dove and when you look at the spurs of the flower in this light; the claws are suddenly transformed into a ring of doves with delicate heads and beaks all joined by touching outstretched wings. A less ornithological name is grannys’ bonnets, but in the 21st century I don’t know any grannies who still wear such things to determine the veracity of this! Take a close look at the photo. Tell me what you see! The walnut trees and the ash trees and the little red Japanese maples that were so cruely fried by the late frost and snow are coming back into leaf and this poem sums the sense of relief I feel perfectly. Last week a huge storm brewed over the garden and the sky was black with towering clouds. A wall of warm air swept over us and riding the tumult, the unmistakable black scimitar of returning swifts. Twenty four birds were blown in screaming and screeling in the high clouds above us with an outriding guard of buzzards and kites to usher them in. Swifts ( martinet noir) are always the last hirundine migrant to return to our area. First come the house martins ( hirondelle de fenetre) with their stumpy white tails, then the swallows (hirondelle) trailing their beautiful tail streamers and finally the largest of all: the swifts. One swallow may not make a summer, but a swift really does and their arrival has marked the start of summer after such a fickle spring that veered between bright sunshine and devastating frost and snow. Swifts and swallows will make their nests in the eves of houses, but despite putting up the right sort of bird boxes they have unfortunately never chosen our house. I fear the reason is that there are just too few of them and like so much of our wildlife their numbers are in decline. The LPO (French equivalent of RSPB) has a nationwide survey of house martins this month and we are going to walk every lane and street of our village looking for signs of nests, to enable ecologists to get a real picture of numbers. I was very heartened last week to sit in a friend’s garden where a cloud of house martins swooped between the houses catching insects. Many of them are obviously nesting close by on new buildings and as long as their hosts don’t mind a little mess, the martins can raise their young in peace and raise our spirts with their freedom and beauty. The elusive catch of sweet lilac blossom spilling into rain washed morning air; the spicy cloves of pinks and carnations redolent of weddings and button holes; the unexpected tang of soapy irises caught in a cloud on a still afternoon; the honey sweetness of tiny alyssum flowers foaming unnoticed around a warm stone. An English bluebell wood shouting heavy luxuriant hyacinth to a slope of spring sunshine; the cacophony of exotic orchid voices spilling from marvelous and manifold flowers pressed and sprawling against the glass of a hot house. One of the hardest things to describe is the perfume of a flower and yet so often it is the most wonderfully intoxicating thing about it! I have just finished reading The Hidden Life of Trees by Peter Wohlleben and I have to share it with people who love wildlife all over the world. This book is the most extraordinary insight into the complex life of a forest and of trees everywhere. I am going to resist the urge to simplify or summarise this wonderful book, as the digital world has a tendency to reduce the multifarious and complex into banal sound bites and snippets and this deserves real reading. It doesn’t have to be read cover to cover in one sitting, it can be dipped into and out of whenever the clouds roll over and you want to be indoors, but you will want to finish it and I have even decided where I want to buried based on this lovely, life affirming book! For lovers of bird song this broadcast is outstanding. For those of you who don’t have six and half hours to listen to this sound fest, just go to 6 hours on the slider and listen to the spine tingling music of the ladies who sing with birds. It made us cry it was so unexpectedly, heart stoppingly beautiful. Leaf or plane or moth? The hedgehog is back. All prickly bristles and soft button nose, she trundles through the flower beds rooting out slugs and bugs. She also likes the odd hand full of cat biscuits and I have found her blinking in the lights under the bird feeder enjoying a few discarded seeds. I love her muscular wriggle and the low tank of her little body pushing through the long grass and waving the flower stalks as she trundles on by. Hedgehogs have an excellent sense of smell, but tiny eyes and so if the wind is in the right direction and I move slowly, I can get very close to her before she gets a whiff of me and shoots off with surprising speed. Hedgehogs need to be able to roam over quite a large area to find food and I am sure my hedgehog visits many gardens in one evening and this is their problem. Many gardens have fences and wire enclosures set in concrete all around them and no gap at all for a prickly slug killer like the hedgehog to squeeze through and without this freedom to roam they starve. A few years ago my neighbor filled in a perfect gap under the fence. For two years we had no hedgehogs, so I did a little digging of my own and opened up the gap and now she is back! We all need to mind the gap in our gardens and remember to leave a space for wildlife to get in and out and leave “untidy” corners with weeds and leaves, where bugs will be found and hibernation and nest sites will be made by these useful, delightful nighttime visitors.